The Gold Coast region in the Queensland region of Australia turned out to be my personal favourite among all the places I’ve been to in the country so far. Though it’s true that I still have a significantly larger portion of Australia to discover, out of whatever little of it I’ve seen so far, the Gold Coast remains a particular highlight, and there are many reasons for it. Gold Coast is the epitome of the Australian dream: from exploring picturesque surfing beaches to experiencing laid-back cafes to trying adventure sports of different kinds. In just a 60km of a stretch, you get to do so much that you otherwise don’t in most of the other tourist places in the world. I remember how before arriving on the Gold Coast, I underestimated it as just another upcoming beach towns in Australia, laden with nothing beyond surfing experiences and a laid-back life, but I was wrong. Gold Coast has much more to see and do than one can imagine. If white sand beaches and turquoise water is something why you’re planning to visit Australia at first place, then the Gold Coast is going to be a real treat for you. The coastline of the Gold Coast (that stretches for 57km) allows you to choose from 20 different beaches all of which are perfect for surfing and swimming throughout the year. Though the Surfers Paradise is the most well-known of them all and you will be hearing quite a few recommendations for it during your stay in the Gold Coast, I will advise checking out the Snappers Rock and Coolangatta if you want something quiet and old-school beaches in Gold Coast. Australia is known for surfing, and the Gold Coast offers a number of surfing schools to choose from. 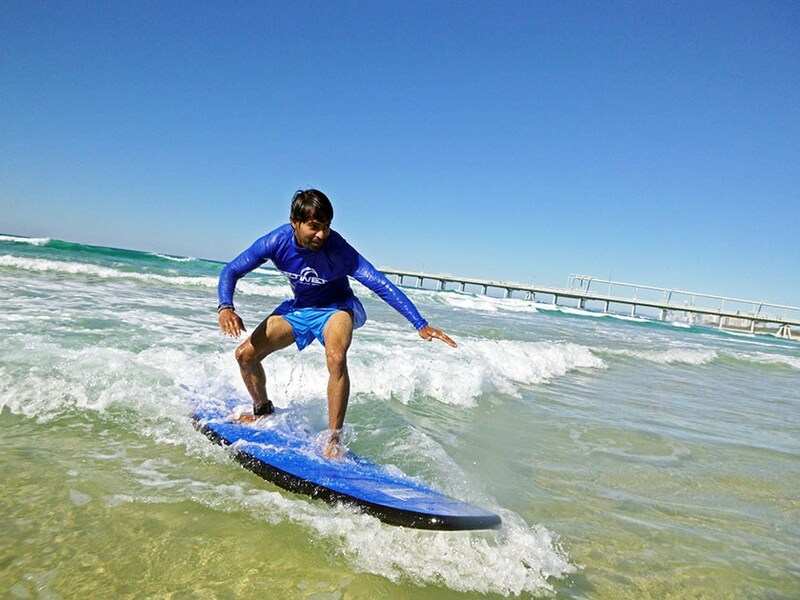 With lessons starting for as low as 55 dollars (with a stand-up guarantee in just a few hours) or a surfboard hire for just 20 dollars for a day, the Gold Coast is a real surfers paradise, not just that it has a place with that name. Tip: For learning surfing, I can recommend a tour company called Get Wet Surf located at the Main Beach in Surfers Paradise. Sign-up for a 2-hour introductory surfing lesson to learn the basics and then hire a surfboard and master the art by yourself. Surfing is totally fun and a very safe adventure activity to learn. From arts and crafts to open farmers and food markets, you have got enough choices to choose from when in the Gold Coast. Hosted in the Hinterland, along with the beaches and in the suburbs, you’re sure to pass at least one as you’re wandering around. A few must-see markets when in the Gold Coast as I personally explored and found worth appreciating are: Broadbeach Markets on the first and third Sunday of every month for interesting arts and crafts; Surfers Paradise Beachfront Markets, every Wednesday, Friday and Sunday, that, in fact, is also one of the biggest on the Gold Coast; and last but not the last, the NighQuarter a weekend night market for food, local arts and craft and live performances. They all are a real treat for avid street-photographers. Though theme parks are one of the reasons why many tourists (particularly the Indian and Chinese tourists) visit the Gold Coast at first place, they still make for a good excuse for you to be planning a holiday in the Gold Coast – particularly if you’ve kids. Visit the largest theme park of Dreamland, that, from Kangaroo feeding to adult-thrill rides to a Madagascar movie-themed park for kids, has something for everyone. Other than this, you have water parks as well as the movie world based on Warner Bros movie-themes. One thing many visitors do not expect from the Gold Coast as a beach-town is having a few national parks too with rich wildlife to spot. Currumbin wildlife century, for example, is a lovely place that can make your holiday to the Gold Coast much more memorable, because for anyone one of the prime experiences to be travelling to Australia, no matter what part of the country they travel to, is spotting a Kangaroo and Koala – at Currumbin wildlife century, however, you get to feed one and hug the other, and click many pictures during the process. If not satisfied, you can also try holding a python. Other than Currumbin wildlife century another highlight is the Springbrook National Park and all is wilderness to find hidden waterfalls, lookouts and wildlife. Just like Currumbin wildlife century, the Springbrook National Park can also be visited on a half-day trip, but if you have a little more time in hand, consider renting a cottage or a cabin in the park to get a real taste of living out in a rainforest jungle. If the idea of holidaying in Australia was enjoying the nightlife then look no further than Surfers Paradise. Considered as the heart of the Gold Coast, at Surfers Paradise, you will find bars, nightclubs, pubs, and a vibrant young crowd to befriend with. Check out the Island Rooftop ‘the bar with a view’ for some quirky cocktails and live performances. At Surfers Paradise, there’s either a nightclub or a pub or a bar at every corner. If there’s one word that sums up the Gold Coast, besides FUN, it is options – particularly when it comes to food. There are literally hundreds of restaurants, cafes, clubs and bars with a dish and a price point for everyone. One moment you will be barefoot in your swimming shorts sitting on plastic chairs in an outdoor cafe, while at the next minute you will be in a fine dining hotel with your bow-tie, listening to live jazz music. During my 8-day stay in the town, I ate at a variety of places for breakfast, lunch and dinner with most of the place being casual and family friendly. Bazaar, at QT Hotel for dinner, Cafe D’bar at Snapper Rocks for the morning breakfast, NighQuarter for an open food-market experience (every weekend) and Greenhouse Canteen and Bar for Vegan lovers. No trip to Australia (particularly the ones done around the eastern coast of the country) is complete without experiencing the rich coral life underwater at the Great Barrier Reef. From the Gold Coast, one can try a few different day trips to the island on its north and experience diving or snorkelling in the Great Barrier Reef. I did a day trip to Lady Elliot Island from the Gold Coast which included a total of 3-hour scenic flight to and from the island and a couple of snorkelling sessions in the Gret Barrier Reef. Home to a few different types of turtles and manta-rays the Ladt Elliot island is a must visit if you’re a swimmer. A fire truck ride, an adrenaline jetboating tour, a jetpack ride… if it sounds crazy and bizarre enough it can be done in the Gold Coast. If you’re a big group (say more than 10 people) a fire truck ride with some Bollywood music (as we had it) or a group jet boating tour can give you a memory of a lifetime. And yes, it can be done in the Gold Coast. If you are planning a trip to the Gold Coast, I will suggest booking a flight with the Scoot Airlines for their competitive air-fares. Though a low-cost airline, for those who appreciate a little more comfort they have a premium economy and business class too. They run from Hyderabad, Bangalore, Amritsar and a few other destinations in India. Disclaimer: Dev was invited by Queensland Tourism for a 5 day trip to the Gold Coast. Though the trip he was hosted by them, all recommendations and suggestions are solely his own.